Founded in the market over 60 years ago, Our Lady of Lourdes Regional Medical Center constructed a completely new, state of the art hospital in 2011. Encompassing 45 acres as the largest building project in the history of Lafayette. Known for exceptional patient care in the community, recognized as a Stroke Center of Excellence, the creator of the Louisiana Stroke Network; as well as one of the top orthopedic programs in the nation. Lourdes also provides the only burn unit in Southwest Louisiana, in addition to the area’s first cancer network. Our Lady of Lourdes Regional Medical Center employs more than 1800 people, a medical staff of over 400 active physicians in a variety of medical and surgical specialties, providing a wide-ranging network of facilities and services. 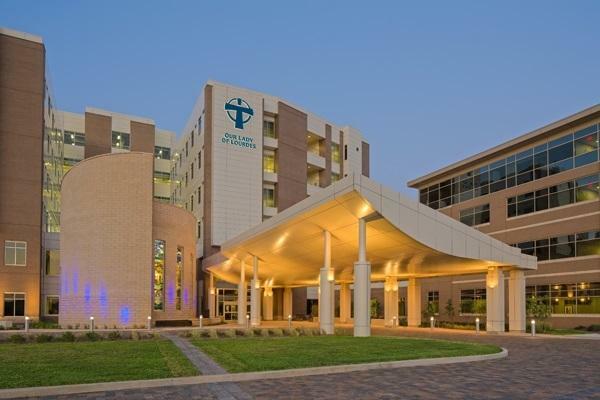 Lourdes is a wholly owned subsidiary of the Franciscan Missionaries of Our Lady Health System, which is the largest locally-owned, not-for-profit health system in Louisiana. We are the local healthcare leader, providing the most outstanding cardiac care in the region, a Stroke Center of Excellence, as well as one of the top orthopedic programs in the nation. Lourdes also provides the only burn unit in Southwest Louisiana, in addition to the area's first cancer network. Our Lady of Lourdes rests in the beautiful community of Lafayette which offers a rich Cajun culture with arts, entertainment, and museums. There are also world famous festivals which are centered around music, food and family. This area is also well known for abundant hunting and fishing. The Wall Street Journal’s MarketWatch.com recently named Lafayette, LA as the “Happiest City in America” and it’s no mystery why. Located in Southwest Louisiana, city population of approximately 125,000 with service area population of over 444,000. Lafayette is located a little over 2 hours west of New Orleans and 3 hours east of Houston.